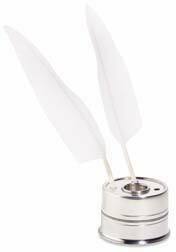 Order your Goose Quills With Pewter Ink Stand today from FahrneysPens.com. Fine Pens, Refills & Luxurious Gifts – great prices & fast shipping. It is a longstanding tradition at the Supreme Court of the United States to present quill pens to attorneys who argue before the Court. Trimmed in a centuries-old style by the supplier to the Supreme Court, this matched set of quills is handcut with functional writing nibs. The Countinghouse Reproduction Inkstand design dates back to the 16th century. The solid pewter inkstand has four holes for quills around a center inkwell. An example of this inkstand is displayed on Jefferson's revolving desk at Monticello. Enjoy a little bit of history with this unique set.